The Rt. Rev. Frederick Houk Borsch, fifth bishop of the Episcopal Diocese of Los Angeles, died in his sleep April 11 at his Philadelphia home. He was 81 and succumbed to complications of myelodysplastic syndromes (MDS). He is survived by Barbara S. Borsch – his wife of more than 56 years and an honorary canon of the Diocese of Los Angeles – and by their sons Benjamin, Matthew and Stuart, daughters-in-law Jeannie, Elizabeth, and Fang Zhang, grandchildren Jack, Emily, Owen and Zoe; by his sister Jane Borsch Robbins and by five nieces and three nephews and their families. A funeral service at St. Martin in-the-Fields, Philadelphia is set for April 22 at 1 pm, with a future memorial service to be scheduled at St. Augustine by-the-Sea, Santa Monica; the Borsches have been active parishioners in both congregations. The family has requested that, in lieu of flowers, memorial contributions be made to Neighborhood Youth Association, an institution of the Diocese of Los Angeles (1016 Pleasant View Ave., Venice, CA 90291, http://nyayouth.org). 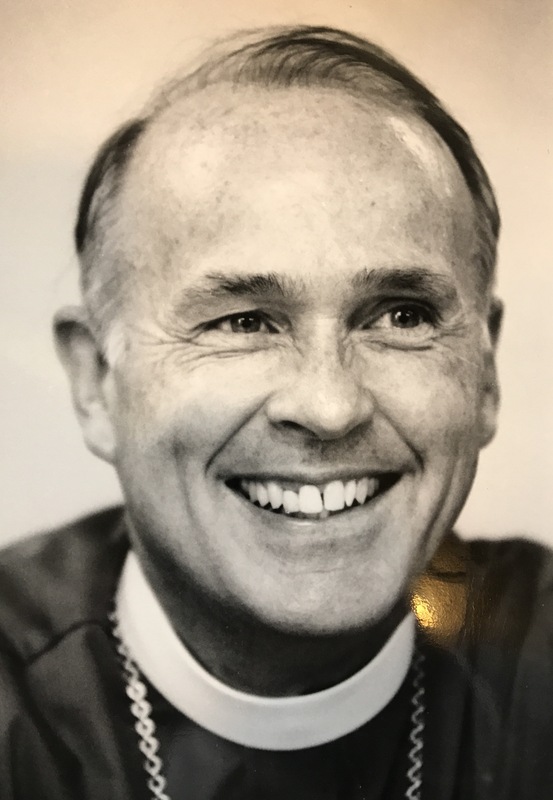 “Bishop Borsch was a great friend of mine,” said former L.A. Mayor Richard Riordan, “but more importantly he was a fine leader of the Episcopal Church throughout the United States. He was a kind and generous friend to all people, especially children.” Riordan and Borsch, both alumni of Princeton University, exchanged views frequently and collaborated in launching the regional Hope in Youth initiative. “Remembering his wonderful and gentle soul will forever remain in my heart,” said longtime friend Octavia Miles, who first met Barbara and Fred Borsch in Chicago at Trinity Episcopal Church there. “Our lives have been intertwined since we were very young people.” Miles and the Borsches found themselves reunited as parishioners of St. Augustine by-the-Sea Church in Santa Monica. Frederick Houk Borsch was born in Chicago on Sept. 13, 1935, to Illinois native Pearl and Reuben Borsch, an attorney. In his 2001 book The Magic Word, Borsch writes in a chapter titled “Piper City Christmas” of childhood visits to his Grandfather Houk, an undertaker and salesman of furniture and caskets, whose farm-style house doubled as both residence and funeral home. There, with his grandmother, Minnie, and his Aunt Vera, Borsch and his family enjoyed much singing around the piano, including the standard “You Are My Sunshine,” which remained one of his favorite songs long into adulthood. Prior to his election in 1988 as bishop of Los Angeles, Borsch was dean of the chapel and professor of religion at Princeton University. There he taught courses in religion and history. Several of his experiences there are recounted in his 2012 book Keeping Faith at Princeton: A Brief History of Religious Pluralism at Princeton and Other Universities. He was subsequently elected to the University Board of Trustees. From 1972 to 1981, Borsch served as dean, president and professor of New Testament at Church Divinity School of the Pacific in Berkeley, Calif. There Borsch was affectionately known as “Fred R. Dean,” and joined students and fellow faculty members on the basketball court, around the bridge table, and on stage in the annual seminary theatre review. A lifelong sports enthusiast, Borsch enjoyed regular jogging, swimming, canoeing, and playing tennis. He was particularly a great fan of baseball and became a home team fan wherever he lived, counting among “his teams” the White Sox, A’s, Dodgers and Phillies. He loved to be outdoors, whether it was playing tennis, walking or jogging in the canyon behind his house in Los Angeles, swimming in any available body of water, regardless of temperature, or canoeing in “the north woods”. He shared his love of the outdoors with friends and family, but also reached out to bring children outdoors throughout his ministry. While an undergraduate at Princeton, he was the student director of the Princeton Summer Camp, now the Princeton-Blairstown Center, a New Jersey camp which provides camping experiences to urban youth in the New York-New Jersey metropolitan areas. As Bishop of Los Angeles, he supported the diocese in the purchase of the Episcopal Camp at Wrightwood to provide additional camping opportunities for children throughout Los Angeles. Borsch was also an enthusiastic traveler, making friends on six continents. He rafted the Grand Canyon, climbed to Machu Pichu, and snorkeled in the Great Barrier Reef as well as trips to different parts of Africa and making almost a second home in England. Educated at Princeton, Oxford, and New York’s General Theological Seminary, Borsch held a Ph.D. from the University of Birmingham in England, conferred in 1966. He held a bachelor’s degree in English literature from Princeton, earned in 1957. Ordained to the priesthood in 1960 in the Diocese of Chicago, Borsch first served in ministry from 1960 to 1963 as curate of Grace Church in Oak Park, Illinois. As bishop of Los Angeles, Borsch served as chair or member of a number of boards of directors including Good Samaritan Hospital, Hillsides Home for Children; Neighborhood Youth Association; the Diocesan Investment Trust; the Cathedral Corporation; Diocesan Council, and the Corporation of the Diocese. Also he was chancellor of the Harvard-Westlake School; chair of Los Angeles Council of Religious Leaders (1993-1994); founder (1991) of Episcopal Urban Intern Program; co-founder (2000) of the Los Angeles Interfaith Environmental Council; and a director of the Los Angeles World Affairs Council (1992-2002). He also served a term as president of the Los Angeles Council of Religious Leaders, guiding its members to form the “Hope in Youth” initiative. Ndungane and Borsch worked strategically with Archbishop Emeritus and Nobel Laureate Desmond Tutu in solidarity to end apartheid in South Africa. Borsch hosted Tutu and his wife, Leah, on visits to Los Angeles, and he remained active in other international initiatives, forming the diocesan World Mission Group and establishing companion diocese relationships with El Salvador, North Central Philippines, and West Africa, among others. Borsch was author and editor of more than 20 books, including two novels and ranging from his classic Many Things in Parables to the more recent titles The Spirit Searches Everything: Keeping Life’s Questions (2005) and Day by Day: Loving God More Dearly (2009). He wrote poetry throughout his life, most of it personal, but many works finally published in the collection Parade: Poems of Light and Dark and Light Alike (2010). A full listing of his works is found at www.frederickborsch.com. Themes of life and death are found in several of Borsch’s writings, including a 1995 reflection – “Where Was God When the Plane Crashed?” – recounting his experience among surviving passengers when a DC-10, upon landing at Boston’s Logan Airport, skidded off the runway, over the breakwater and into the harbor on a snowy evening. If you were a friend of Fred’s he forever had his hand on your shoulder and was always ready to engage in light or serious discussion. The world, truly the world because of his universal life, has a more tender tone because Fred walked among us.